We’re on a mission folks, and a number of you have been very active in our forces to help bring about the necessary change to help restore the timeline and fix what has gone very, very wrong. You’ve heard a number of times that we need to live in the now… live for the future… let go of the past… and many other idioms that speak of the ages of yesteryear being long behind us and holding us back from becoming who we might potentially be. The thing is… following that advice doesn’t seem to be making a clear and positive change in the present world, either! And that is why we aim to fix what broke… and revive Disco! Now, we’ve got a ton of flashy and psychedelic dresses out there and several folks have already taken to the floors to keep Stayin’ Alive with the flash of the Disco Balls, but we need help from every corner and every dame and gent to make this happen. 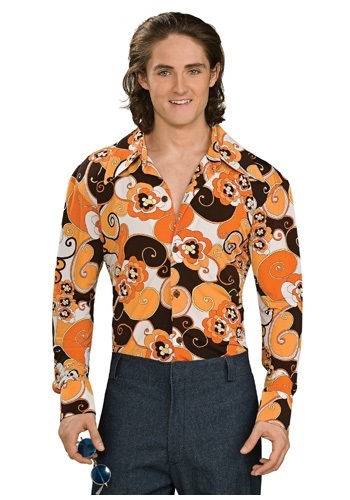 So, gear up, fellow Chrono Crusader, with this Paisley Disco Shirt. All the hot mammas at the disco need the kind of man who's not afraid to strut his stuff and boogie on the dance floor, and this long sleeved button-up orange, yellow, and white paisley patterned shirt is just the way to make it happen. Finish off the look with the right hair, pants, and vivid white shoes and we’ll all be Dancing Queens and Kings again!